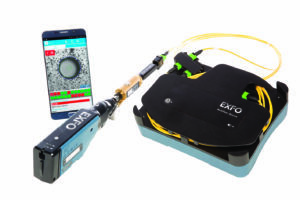 Exfo, the communications industry’s test, monitoring and analytics experts, has announced the first automated solution that combines testing of polarity, continuity and connector cleanliness (the critical tests needed to validate multifibre push-on (MPO/MTP) links) into a single solution that delivers an optimal combination of fit, cost and reporting capabilities. The ConnectorMax MPO link test solution pairs a light source at one end of the cable with a fibre inspection probe for analysis at the other end—a first in the industry. Additionally, it is the only all-in-one solution that provides a clear pass/fail diagnosis of MPO 12 and MPO 24 links in a single report. As many customers already own an Exfo probe, this solution is highly economical. Not only do field technicians benefit from a MPO inspection tool on the market that eradicates the number one cause of network failures (contaminated connectors), it now also enables them to check polarity and continuity in just about the same time as inspection alone.